If you’re overwhelmed by your kids’ clutter or you’re just tired of dealing with it, you’re not alone. Even if you’re organized yourself, it’s a completely different ball game when you’re organizing with—or for—your kids. The trick for parents is to understand your child’s organizing style and recognize that what works for you may not work for your child. If you’re overwhelmed by your kids’ clutter or you’re just tired of dealing with it, you’re not alone. Even if you’re organized yourself, it’s a completely different ball game when you’re organizing with—or for—your kids. The trick for parents is to understand your child’s organizing style and recognize that what works for you may not work for your child. Organizing with Your Kids will show you how to unlock your child’s organizing code, putting an end to battles and frustration. Best yet, because this class is on-demand, you can start today! 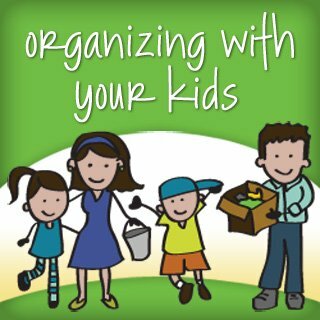 How will you (and your child) benefit from taking Organizing with Your Kids? Find out how to involve your child in organizing projects so he/she has ownership, loves the results, and is more motivated to keep his or her room organized going forward. Learn how to declutter your child’s belongings together instead of letting go of things when your child isn’t around, establishing a sense of mutual trust and respect. Get checklists, worksheets and bite-sized action steps that make it easy for you and your child to get organized! Create organized spaces together and create a shared sense of accomplishment. Improve your relationship with your child by putting an end to disagreements over clutter. Life at home will be easier and more harmonious for you and your child. Give your child the gift of organization—a gift that will last a lifetime! 80 pages / 3 lessons of easy-to-implement content. Includes reading materials, questionnaires, checklists and planning forms delivered as colorful, printable, and editable pdfs. You can add notes to your handouts electronically and create a customized action plan without creating paper clutter. Materials format: Written (downloadable PDFs and/or online webpages) and audio (MP3s). All materials are downloadable. Use the format(s) that work best for you! I’m professional organizer Aby Garvey and this may surprise you, but I’ve been overwhelmed by my kids’ clutter a time or two before. But here’s what I know for sure: Kids can learn how to get organized just as they can learn how to ride a bike or brush their teeth. And you, as their parent, are the best person to teach your child how to do it. With the tips, secrets and strategies presented in this class, you’ll learn the process I’ve been using with my kids to break through the overwhelm and teach them how to organize. You’ll leave this class armed with a plan and a process to create organized spaces that will work well for your kids and you. 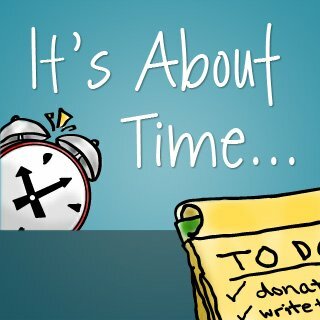 Plus, you’ll have some finished projects checked off your to-do list! Finally, you’ll have strategies for teaching your child organizing skills and habits that will serve them well for the rest of their lives. Here’s how we’ll do it. Lesson 1: Commit, Decide, Declutter! 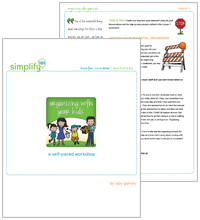 In this lesson you’ll discover common organizing obstacles you and your child may encounter as you organize together, plus get simple strategies to detour around them. 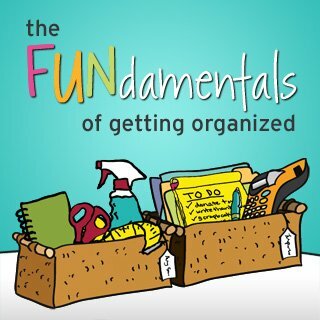 You’ll also find out how to take the frustration out of organizing with your child, even you’re currently overwhelmed by all his/her stuff! 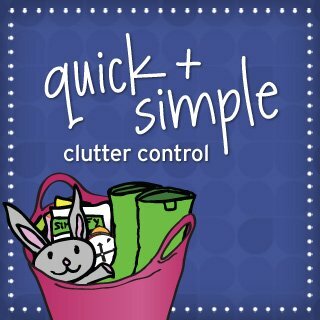 Finally, you’ll learn—and put into action—a simple decluttering process you and your child can do together to make it easier to let go of items your child no longer uses or loves. In this lesson you’ll find out how to organize and store your child’s items in a way that makes sense to him—making it easier for your child to use his things (and put them away when he is finished!). You’ll also get a checklist that will take the guesswork out of setting up organized and easy-to-use spaces for your child. Finally, you’ll find out how to select storage solutions and stretch storage space so you can carve out kid-friendly homes for your child’s belongings and foster your child’s independence. At this point in the class, you and your child will have some finished projects under your belt and you’ll be feeling thrilled about the results you’ve created together. If you’re worried that your organizing results will unravel before your eyes, the ideas in this final lesson are for you! You’ll get five simple projects and 13 habits that will make it a breeze for your child to stay organized! For this class to be effective for you and your child, it’s important that you still have your child’s ear. In other words, you and your child need to communicate effectively with one another and work together as a team.